Who ever thought we’d see Ant-Man on the big screen? Out of the Marvel Heroes on offer, it seemed absurd to go run with the ant. Yet in the world of Guardians of the Galaxy, it kind of makes sense to become a little weird and slightly silly and Marvel embraces all that. I don’t want to talk about the drama behind Ant-Man’s production, other than to say there are flashes of Edgar Wright’s madcap genius here or there. There’s no point in lamenting what would have been because you can’t change that. So let’s talk Ant-Man. 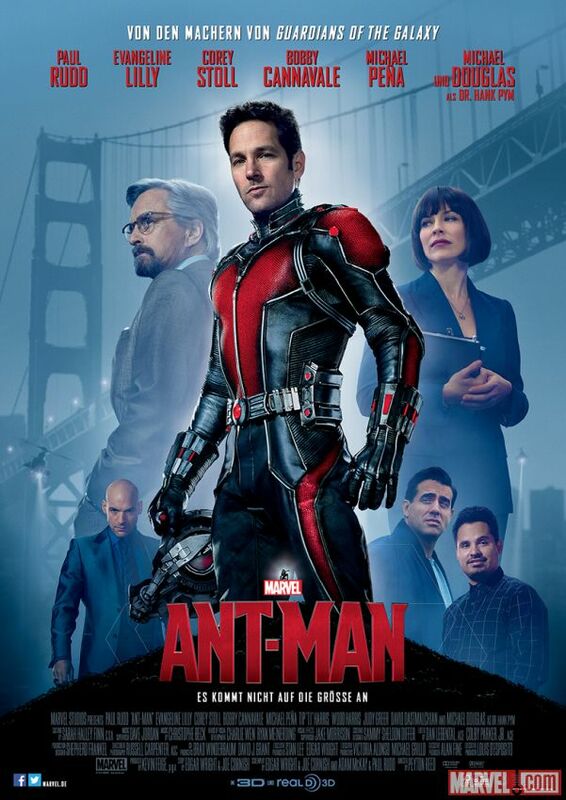 The desperate thief, Scott Lang – played with charm by Paul Rudd – is recruited by scientist Hank Pym (Michael Douglas delivering classiness) to become the Ant-Man and stop the shrinking technology from getting into the wrong hands. Ant-Man shrinks, that’s his ability. Or rather, that’s the suit’s ability. But whatever, Lang has to harness the suit himself so I guess there has to be some ability in that. But aside from that and communicating to ants and increased strength, that is his power. I wanted to address that to people now because the complaint I hear a lot is “Is that all he can do? That’s lame” and I think the complete opposite. Consider the environment around you? Seriously. Take a look at your floor, furniture and everything else. Now imagine what you could get up to or how you might see the world as a tiny person. Now think of how an action scene might be executed in that environment. Isn’t it exciting? Maybe? Maybe not so much? Ant-Man’s action sequences are exciting, engaging and pretty exhilarating. He zips around, shrinks, grows, smacks people around. It breathes life into what can sometimes be a tiring superhero-on-superhereo smack down. Backing up Ant Man’s world is a certain self-awareness. The film knows its absurd, it knows these grand battles in tiny form look ridiculous from our regular viewpoint. And the film just runs with it, embracing the silliness and using it humorously. Paul Rudd’s a likeable heroine here. We see enough of his Scott Lang to go on the journey with him and Rudd gets a few laughs out of the journey. Michael Douglas could’ve easily phoned it in but he seems to embrace his role, bringing some class to it all. Likewise, Evangeline Lily – who is given enough to work with to and lends solid support. Corey Stoll is the underdeveloped villain Darren Cross. You get pieces into his mindset but its not enough. He’s a weak villain but Stoll sells it regardless, making for entertaining viewing. Ant-Man is a surprise, I’ll give it that much. That and it’s quite fun. Its probably the most fun I’ve had with a blockbuster apart from Mad Max earlier this year. It doesn’t tread any ground or reach dizzying heights or what have you but there’s laughs, there’s really cool set pieces and there’s heart.